« Farm Bill 2014 – Progress or Business as Usual? United Students Against Sweatshops (USAS) is holding a national conference at the University of Texas in Austin. It began yesterday, despite the campus being closed, and continues today, Saturday, February 8th. Hundreds of students from USAS joined with UT Save Our Community Coalition to rally against UT’s plan to outsource jobs to the global firm Accenture. The plan would cut 500 jobs and displace hundreds of community members. 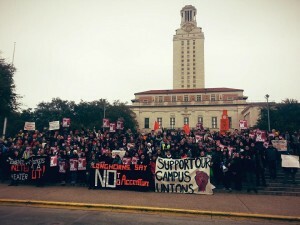 USAS & UT Save Our Community Coalition rallied against outsourcing jobs to Accenture on the UT Austin campus on Friday, Feb 7. According to USAS’ website, “USAS member voted to hold the conference at UT …where the weather is as unpredictable as its citizens. 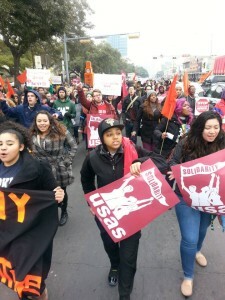 Here in the birthplace of right to work (for less), women’s health care is under attack, our immigrant community is under attack and minorities are being attacked left and right.” UT students are taking action with the community and campus workers to stop privatization of the University of Texas and the outsourcing of hundreds of jobs. These jobs include on-campus positions and workers abroad who make the collegiate apparel for the university. Students from USAS marched to the UT Austin campus with UT Save Our Community Coalition to rally against outsourcing jobs to Accenture on Friday, Feb 7. Students at the conference are learning to plan national USAS campaigns, sharpen organizing skills, get new ideas, and work to build a student-labor movement. Workshops are lead by labor organizers and veteran student organizers. USAS is the nation’s largest youth-led, student labor campaign organization. The organization has won precedent-setting campaigns and works to educate students of the dominance corporations have in a globalized economy. 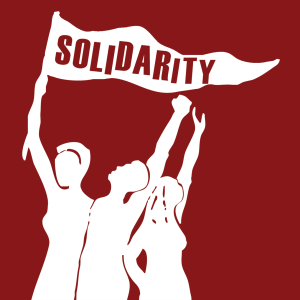 Successful and significant campaigns include organizing rights, fair contracts and living wage policies across campuses, communities and the United States. The organization also supports ensuring university support of good employment standards in local economies.